Y’all, I am so excited. I was chosen, along with others, to be on the launch team for Crystal Paine’s new book, “Say Goodbye to Survival Mode”. If you don’t know who Crystal Paine is then you really need to check out her site, Money Saving Mom. I absolutely adore Crystal and the work that she does. She’s pretty much my idol! Being a part of the launch team means that I get to read an advance copy of the book and I just have to say that this book is a God send. One of the things that I’ve always liked about Crystal is her ability to take what seems impossible possible once more. She does this by helping her readers to break goals and dreams into small, manageable pieces. Once you know where you are going, you have to break down the steps needed to get there! For the last year I have felt that I am barely surviving while things I want to do have fallen by the wayside. One of those things is this blog. I always tell myself that I will make time to write and then end up forgetting about it. I don’t even have the goal to make money off of my writing anymore. I just want to reach people. Anyway, part of the roll out for her new book is a free 7-day challenge that you can sign up for. The challenges for each day are taken right from the book. I strongly encourage all of you to sign up. 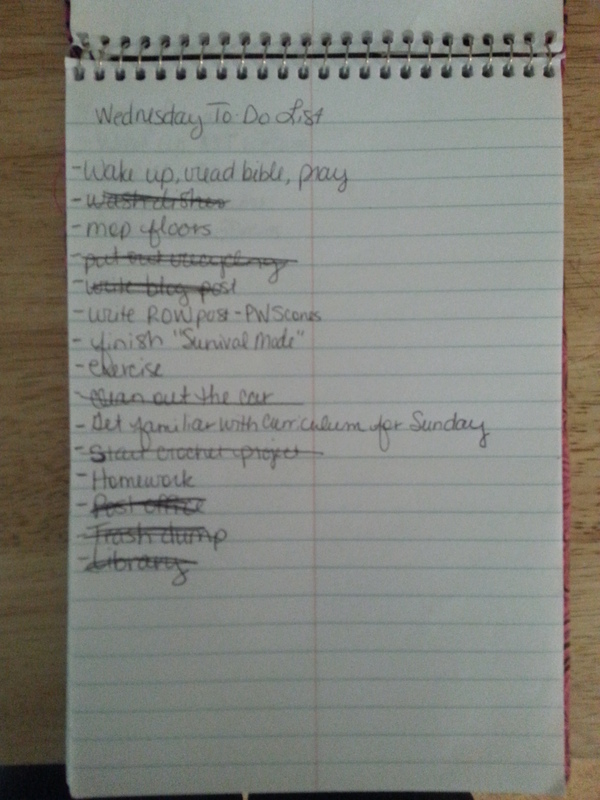 I forgot to take the picture until after I had already started completing items on the list. The two items I crossed off automatically were “start crochet project” and “clean out car”. Those were things that I would love to get knocked out but that I didn’t need to kill myself to get done. It feels weird to sit and think about the good when I’m usually focused on things I don’t do well. 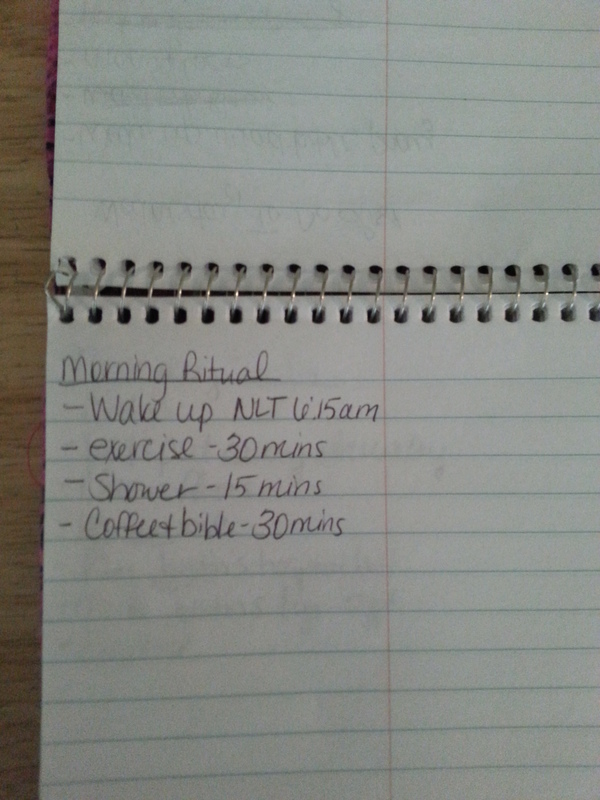 Day 3 (Thursday): Create my ideal morning routine. Wake up NLT (no later than) 6:15 a.m. I know that I’m more productive when I can get up before the kiddos wake. My problem is that I can never seem to get in bed at a decent time. Justin also still wakes up anywhere from 1 to 2 times a night so I don’t get much non-interrupted sleep. I also sometimes feel like I neglect one of the most important things and that’s my physical and spiritual health. I need to start taking care of me so that I’m not so burnt out all of the time. In a few days I’ll post again with days 4 & 5 of the challenge along with an update on how I’m doing with getting up earlier. Do you plan to sign up for the challenge? Let me know how you do and what you think by commenting below or sending me a tweet!